The Harbour at Traeth Bychan started life as a quarry and was later transformed into a dock, servicing the nearby quarry where it was used to load millstones. It seems that the quality of millstones here was unsurpassed and they were exported all over Britain including, in 1314, one purchased for the sizeable sum of 28/9d by the Royal Mill in Dublin. Doubtless many of the fifty windmills in Anglesey that helped contribute to it being called the "granary of Wales" had some stones that came from this quarry. This picture clearly shows the boats used to ship quarried stone. The boats will have entered from the origional entrance to the left which is now closed off. In the background you can see the runways and conveyor system from the quarry at the back of the beach and the old quarry house which is still there. Boats are; top left – Sarah of Beaumaris built Chester 1832 and wrecked 1911. Bottom left – Darling of Beaumaris built 1781 wrecked 1893. Right – a Mersey steam flat. Quarried stone was exported, mainly to Liverpool, but also further afield. Photo predates 1893. This picture shows the same area of the harbour and remains relatively un-used being silted up with thick mud although the quay walls are still clearly visible. This is a view of the beach taken after quarrying had ceased to operate but before the area at the back of the beach had become overgrown. The quarry area has now become a caravan site and the Red Wharf Bay Sailing club house has since been built . The large stone structure/tower, adjacent to the club house is understood to be a pylon support for the overhead conveyor system that carryied stone from the quarry to the harbour. The base of the clubhouse is an old machine bed on which, at the height of the operation, there would have been a steam quarry engine on it. In certain conditions you can still see wooden stumps in the sand below the quarry site and are again, linked to the conveyor system. Below are views of the harbour from the back. Note the lack of shrubs around the side of the harbour. The harbour wall to the right collapsed a number of years ago and was rebuilt but is still in need of some attention to restore it to its origional state. 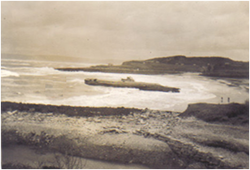 HM Submarine Thetis beached at Traeth Bychan, Anglesey. On 1 June 1939 HMS Thetis, a "T" Class submarine built at Cammell Laird ship yard in 1938, left her mooring in the Mersey with 103 crew aboard to carry out some trials in Liverpool Bay. She made her first dive on 2 June 1939 but did not re-surface. Only five men escaped. A few months after this tragedy, Thetis was brought to the surface and beached on Traeth Bychan beach, here on the east Anglesey coast. After beaching at Traeth Bychan, it was towed to Holyhead dry dock, where the remaining bodies were removed by volunteers. All non-survivors are buried at Holyhead. This picture was taken from the back corner of the harbour. Repaired and re-commissioned as HM Submarine Thunderbolt. In November 1940 she sank two German U Boats and five supply ships before being sunk off Sicily by Italian Corvette, 13 March 1943. Amlwch Harbour, some 10 miles further round the coast was focussed on the transportation of copper from the nearby mines at Parys mountain. Such were the numbers of ships using Amlwch as a port at that time that delays were inevitable, and an Act of Parliament was passed in 1793 which allowed for the port's deepening, widening and regulation. Following the exhaustion of the mines, the port became a well known centre for ship-building. The yard belonging to William Cox-Paynter, but more especially the one belonging to Captain William Thomas, a local man who ran away to sea when he was 12 years of age, turned out vessels renowned for their superior workmanship, speed and beauty. Vestiges of these yards remain, in the form of a sail loft, workshop chimneys, and a dry dock quarried out of the living rock. Other buildings such as the watch house with its little lighthouse, several copper bins, as well as a lime kiln, are much as they were in the 1800s.